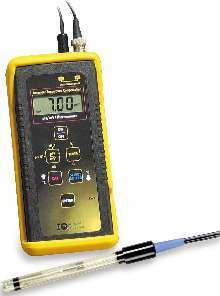 pH Meter offers Automatic Temperature Compensation. Model IQ140 pH meter offers Automatic Temperature Compensation (ATC) and reads pH, mV, Temperature, and ORP. Protected by shock-resistant yellow holster, meter is rugged enough to sustain 6 ft drop without damage. Product is covered by 3 year warranty on meter and 6 months on glass electrode, including glass breakage. pH Meter has Industry's Best Warranty! IQ Scientific Instruments now offers a rugged, yet economical meter with the industry's best warranty -- three full years on the meter and six months on the glass electrode - including glass breakage. The new Model IQ140 pH meter has Automatic Temperature Compensation (ATC) and reads pH, mV, Temperature and ORP. The meter is protected by a shock resistant yellow holster and is rugged enough to sustain a drop from up to six feet without damage.